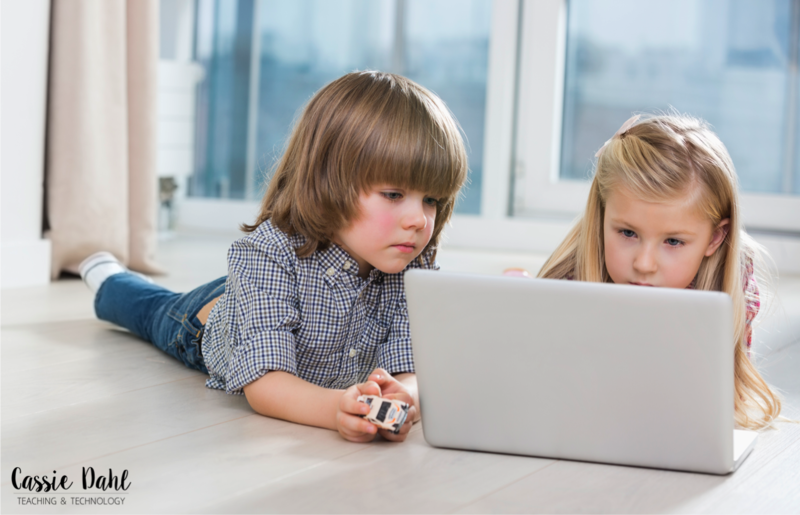 With technology being ever present in the classroom, teachers need to be teaching digital citizenship. What is it? Why is it important? How do I go about teaching it to my students? 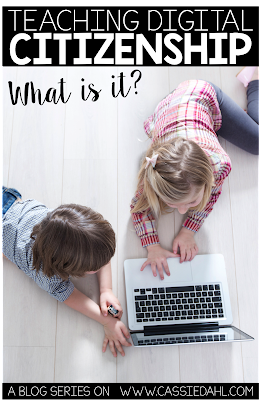 All of these questions are going to be answered in this five part series all about digital citizenship. Let's start with What is Digital Citizenship? 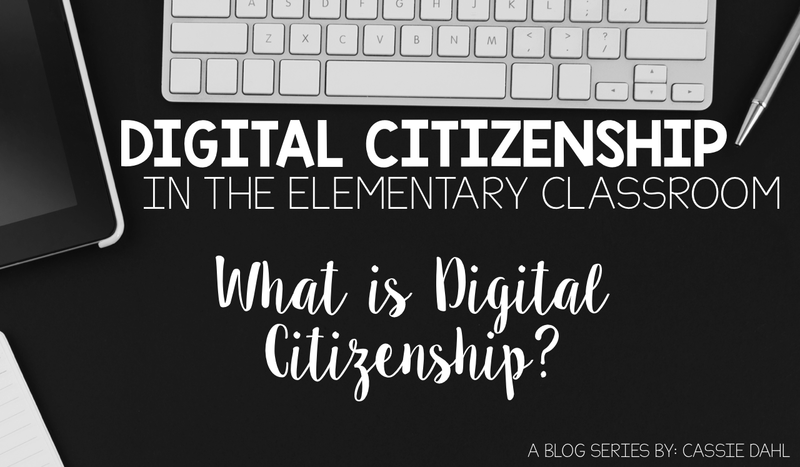 First, let's discuss some terms that are important to know when discussing digital citizenship. Digital Citizen: a person who uses information technology to be a part of society Social Media: any website or app that allows users to create and share content and socialize with others. Digital Citizenship: using technology in a safe, appropriate and responsible way that promotes positive online interactions Digital Footprint: the trail or traces that a person leaves every time they are online, all bits of information about yourself that is available to others Digital Citizenship is like a road map for how students should be using technology and the internet. Students are getting information off of the internet and they need to know how to process and use that information all the while staying safe. participants in our globally networked society." 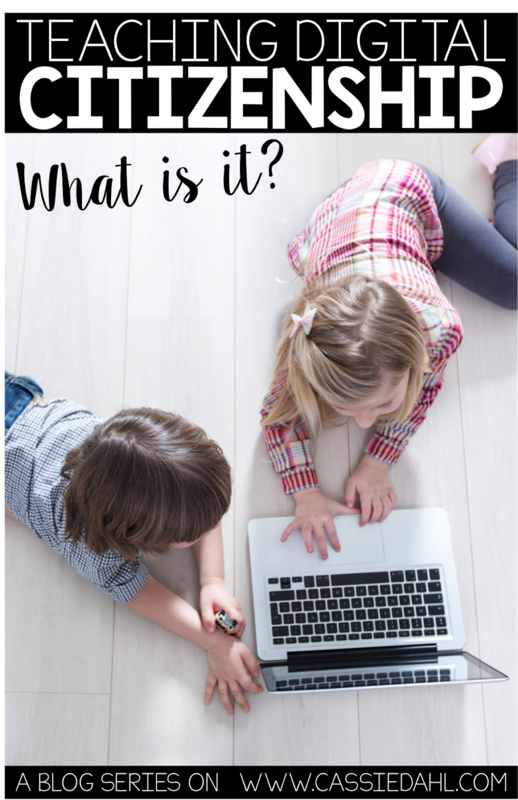 Why is it important to teach about Digital Citizenship? Many of our students have access to devices that will connect them to the world digitally. These devices can connect them in new ways that can be both positive and negative. Teaching about digital citizenship will prepare them to tip the scale towards the positive interactions instead of the negative ones. Laptops, tablets, smartphones, iPods.... our students have access to many of them. Instead of looking at these devices as a toy, Digital Citizenship helps guide students to realize that these are tools that can help them learn while connecting them to the world. By teaching digital citizenship, you will be preparing your students to use social media in an appropriate and beneficial way. Many students do not realize that they leave behind a digital footprint with each interaction that they have online. This footprint can impact their lives forever if they are not acting in a responsible manner while being online. Think about the time you spend online and all of the things you see. From ads to negative posts to inappropriate websites, it is all out there for our students to see and find. Many sites lend themselves to ease of cyberbullying which is another challenge our students face in the world we live in now. By teaching digital citizenship, you are teaching students how to navigate the rough waters that our students tread while they are online. Why Digital Citizenship in the classroom? For me, it's a no-brainer. Many districts are starting to adopt 1:1 or shared technology initiatives. In addition, many teachers are beginning to incorporate technology as part of their homework or in relation to classroom assignments (project-based learning activities, research projects, Genius Hour projects). This added use for technology in the classroom means the pressure is on us (don't worry... it's on the parents too) to teach our students how to function in the digital world and how to be digital citizenship. So where do you even begin? Don't worry- I've got you covered. 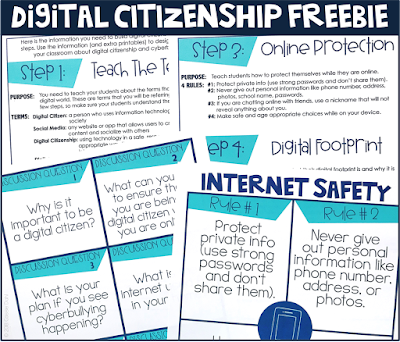 I took some time to map out the 5 main steps to teaching digital citizenship in a handy guide, wrapped it up with a pretty bow and I want to share it with you for FREE! Simply click here or the image below sign up to have the guide and free printables sent right to your inbox! Wanting to come back to this post later? Click the image below to pin the post!